Qlik introduces management team, licensing changes and new hybrid/multi-cloud, augmented intelligence and development features. Here’s my take from Qonnections 2018. “Under new management.” When you see these words in front of a local business, you take note, and it makes you wonder what has really changed? 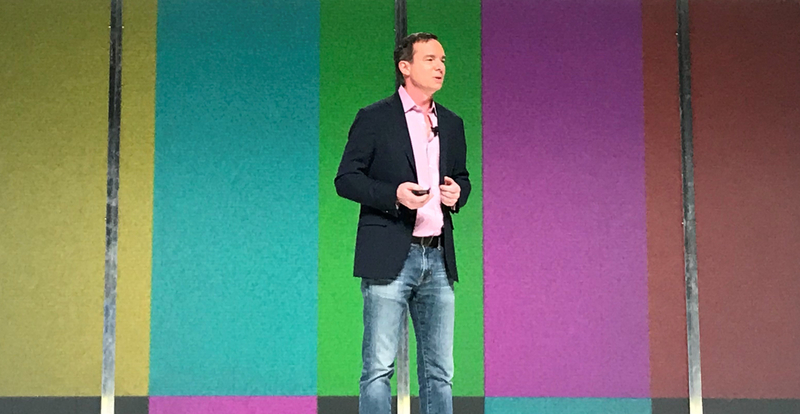 Keynoting at the April 24-26 Qlik Qonnections event in Orlando, Qlik’s new CEO, Mike Capone, after just four months on the job, cut right to the chase and spelled out some important business changes made early in his tenure. Explaining a reorganization that took place in January, Capone said the goal was to refocus Qlik sales and support efforts on large Enterprise customers while “getting out of the way” of channel partners catering to midsize and smaller commercial customers. The reorg brought a fresh round of layoffs (on top of the layoffs carried out in 2016 when private equity firm Thoma Bravo took Qlik private). Downsizing seldom looks good (except to Wall Street), but in a message to partners, Capone noted that Qlik is reinvesting savings from the reorg to boost partner support programs, including qualified lead generation. Qlik’s new CEO, Mike Capone, was previously COO at Medidata and VP, SVP/GM and CIO, successively, at ADP. In a message to customers, Capone promised accelerated development of advanced authoring and visualization capabilities in Qlik Sense, the vendor’s newer, webbier and more self-service oriented product. And despite an “inviolable” promise to maintain support for Qlik View, the company’s original product, Capone also announced new migration tools, a shared Hub interface for all Qlik apps and, most importantly, new licensing terms designed to make it easier to move from Qlik View to Qlik Sense. The licensing change will eliminate the need for a second license. Instead customers will pay a fractional increase in maintenance (somewhere less than 50% of current fees) to add support for Qlik Sense. The Hub and licensing announcements each got big applause from Qonnection’s 3,500-plus attendees. Qlik will promote hybrid- and multi-cloud deployment in part by adding support for containerization and Linux beginning in June. Next steps to the cloud. Qlik’s cloud vision is to support hybrid- and multi-cloud deployment of Qlik applications and services with a microservices-based architecture that will eventually span and unite all deployment approaches. Qlik will take the next step to deliver on this promise in June by enabling Qlik subscription customers to move Qlik Sense applications into containerized, cloud-based instances than can run on Linux in public or private clouds. The Kubernetes, Docker and Linux support are new to Qlik, and it will enable customers to self-manage instances on Amazon Web Services (AWS), Microsoft Azure, Google Cloud Platform (GCP) or their own private clouds. Containerization and Linux support will also benefit managed-cloud services, which are available from Qlik on the Qlik Cloud or from many partners on private or public clouds of the customer’s choice. Qlik’s two-year-old, software-as-a-service-based Qlik Sense Cloud was scarcely mentioned at Qonnections, but it remains an option for workgroup and departmental multi-tenant instances. To better support the new range of deployment options, Qlik is introducing a Hub interface that give users one view — with one log-in, one user ID and one user entitlement – of all their Qlik applications, irrespective of where they’re running. What’s more, Qlik’s management console will enable administrators to set governance policies across all public cloud, private cloud and on-premises instances. Qlik demonstrated a role-playing scenario in which non-regulated (but still access- and security-sensitive) applications and data from a German subsidiary were exposed through a U.S.-based cloud instance. In contrast, privacy-sensitive data subject to compliance requirements in Germany was retained on premises in the demo, but it was made accessible with strict access controls. “Smart” capabilities explained. Qlik announced an “augmented intelligence” initiative last year, stressing that it would support rather than replace human analysis. The company has been developing a Cognitive Engine that will power a number of features to Quick Sense. An Insight Advisor feature added in April recommends the most appropriate visualization options when you select a particular field for analysis. If you don’t actively choose one of these recommendations, the engine will automatically choose what’s seen as the best-fit option. Coming in June, Qlik Sense will gain a hands-off approach whereby you can simply point the Insight Advisor at a data set (rather than a particular field) and it will automatically surface all statistically significant insights. After choosing one of these starting points, users can then select the particular field of interest, as noted above, and get additional recommendations to take the analysis even deeper. Insight Advisor is designed to speed time to analysis for untrained users, but in the spirit of augmenting human intelligence you can interact with the tool and go against its recommendations. In this case, Insight Advisor will flash textual warnings explaining why a particular approach is not recommended. During a keynote demo, a Qlik exec selected a tree map view even though the Insight Advisor recommended a different visualization. Messages appeared noting that there were negative values in the selected data set and that tree maps can’t show negative values. Professionals who don’t want or need this sort of assistance can simply turn the Insight Advisor feature off. In next steps expected sometime later this year, Qlik plans to enable its Cognitive Engine to start learning from the selections that users choose from among its recommendations. In addition, Qlik plans to team the Cognitive Engine with its associative QIX engine, which keeps entire data sets visible for analysis even as you focus in on selected dimensions of data. If you select customers who are buying X product, for example, QIX also shows you which customers are not buying that product. It’s an advantage over drill-down, SQL analysis where you filter out information as you explore, and Qlik says the combination will recommend powerful, serendipitous insights that other technologies would fail to see. Targeting developers and embedded analytics. Perhaps the most surprising and, to me, forward-looking initiative at Qlik has been its effort to promote analytic customization, extension and development both within and outside of the confines of Qlik applications. As one Qlik executive put it, “analytics shouldn’t just be a destination [as in a report or a dashboard], it should be part of the journey.” The idea is to support embedding of analytics into other applications, including transactional applications, so you can turn insights into actions. An app could even be autonomous, quickly taking action based on insights without even requiring a human interface or interpretation. Qlik Core, set for beta release this summer, exposes Qlik analytics capabilites as API-accessible microservices for cloud-oriented development. To open up new possibilities, Qlik introduced Qlik Core, set for beta release this summer. Able to run on containers and Linux in the cloud, Qlik Core exposes the QIX engine through a microservices architecture and APIs. I talked to the CTO at Measur.io, a development partner and customer, who has been using and helping to guide the development of Qlik Core for more than a year. He said Qlik Core is powering the analytics behind the company’s Internet-of-Things (IoT) sensor applications and giving it all the cloud scalability and deployment flexibility the company needs. Pricing for Qlik Core has yet to be set, but the licensing approach will combine free development with consumption-based charges for production workloads. Qlik has also open sourced libraries of capabilities, such as data loading with Halyard.JS, Qlik backend services with Enigma.JS, and charting with Picasso.JS, to facilitate cost-effective development and deployment. Qlik’s Qlik Branch developer community is promoting all of the above, and it’s said to growing quickly, with more than 27,000 registered members. Overall I was impressed by Qlik’s new management team. Capone went straight to the customer hot buttons, including licensing and accelerated development. He’s also putting an emphasis on driving success through better customer outcomes, whether that’s through direct sales or channel sales. Customers that have better outcomes will naturally buy more software, so the company says it will do more to help customers succeed. Shelfware, meanwhile, is viewed as a failure and an outcome that should be avoided (and perhaps even dis-incented in sales incentive programs). My consistent lament about Qlik, shared in my analyses from Qlik Qonnections 2016 and 2017, has been its slow pace to innovation. The criticism still applies on the cloud, AI and big data fronts, where Qlik is still delivering on capabilities initially announced 12 to 24 months ago. On cloud, for instance, the multi-cloud deployment option set for June release will initially be limited to consumption. Apps will have to be authored on-premises and then deployed for read-only access in the cloud. Cloud authoring, write-back capabilities and pull-through access to on-premises data sources are all on the roadmap. Similarly, the (late-to-the-game) Big Data Index that Qlik announced last year and demonstrated at Qonnections 2018 won’t see beta release until June or July. I don’t expect general availability before Q3, at the earliest. I do like Qlik’s platform and QIX associative analysis strengths. I also like the push to enable developers to customize and extend Qlik apps and to create original apps that transcend conventional thinking about analytics. Where there’s confidence in an analysis, human interaction shouldn’t be required. That’s particularly true in emerging streaming and low-latency scenarios where there’s no time for human analysis. My hope is that Qlik’s new management team continues to be responsive and that it will accelerate innovation. If I had to set the priorities I’d accelerate the practical stuff that customers care about today, such as hybrid-, multi-cloud and developer capabilities, while letting demand for AI capabilities build over the longer term.